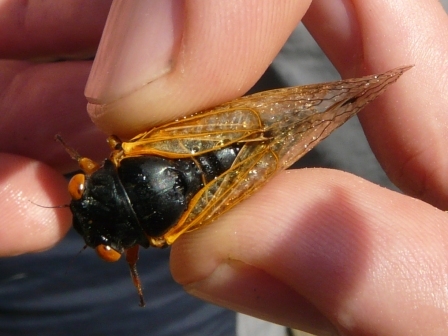 Which species of periodical cicada do we have here? Magicicada tredecim — Underside of abdomen is mostly light orange/caramel. These are the ones that call waaa-oo from the treetops. Magicicada tredecassini — Underside of abdomen usually all black, or with faint orange lines. Magicicada tredecula — Well-defined orange stripes across underside of abdomen. This individual crashed into my head while I was watering the garden, so I brought him down with the water jet and did some catch-and-release identification: Magicicada tredecassini. The sound he was making seems to match that on the magicicada pages also. 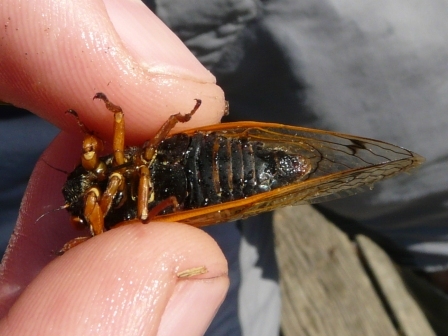 This entry was posted in Cicadas, Insects on June 1, 2011 by David George Haskell.